In this interview she was asked about Billy Bob; they had been married less than a year. You can tell she is absolutely convinced they are going to stay together forever. I still remember this quote, in her husky, cute voice. “We think we love each other a little too much and one day we’re going to be institutionalized and kept apart, in different rooms. We’re just too crazy about each other. But other than that, we’re gonna be fine.” She giggles, but you can tell she’s serious. And my takeaway from that, even though I had never been in love, was that love is about silliness. Being married is about being sillier than you have ever been in your whole life in front of another person, and feeling only safe and adored. Boy, was she ever right. And for the next 10 years, that quote became my mantra. I never let school or work stand in the way of traveling and exploring because I knew that, at the end of my life, I wouldn’t remember any of that. But I would remember taking the biggest bite out of life as I possibly could. I know what it’s like to really, really love a country or place. I know what it’s like to really miss someone because when the whole world is your playground, it’s impossible for everyone you love to be in the same place. I don’t get angry at people anymore; I get angry at systemic injustice. I obsess and go a little crazy with it all, but at the end of the day, the fight for a better world is what gives life meaning. Even sadness makes me feel alive now. I don’t know if I would be this person if I hadn’t caught that interview and started my love affair with Angelina. In 2008, I was finally able to travel to Uganda. It nowhere near mimicked her experiences, which she chronicles in her book, but it did change me. Because her being so open with the media about her life, her past and her thoughts, I was able to use her as my guiding light because when I level up, she levels up twice so I’ll always find something to reach for. Find ways to embrace my past and mistakes because they make you who you are. To not fear darkness and depression because there is always some light to fight for. In your early 20’s you live entirely in your head. As I entered mine, she was coming out of hers. In 2003 she adopted a baby boy from Cambodia and shortly thereafter divorced Billy Bob. If anything, this only strengthened my belief in love. It doesn’t have to last forever to be true love at the time, and acknowledging growing apart is one of the bravest things a couple can do. She also managed to make single motherhood look fun. Me and my baby against the world, and if any man is going to win me over he has to go through my son. At 28, she said, “I’ve come to realize there’s a very strong possibility I might be raising my children by myself and have great lovers and friends, but not find that one great love. I’m beginning to think I’m really supposed to be alone, and that’s okay. I’m very wary about somebody getting close to my son and then it not working out. What if Maddox spends two years close to a man who suddenly is gone? I’d rather he have no father than a 5 percent father who doesn’t want to be there 100 percent, and who he can’t count on his entire life. In a perfect world, you have a partner. If you’re a child with two parents who look after each other and love each other and nurture each other, and who nurture you together, that’s ideal and that’s wonderful. But it doesn’t often work out that way. I didn’t have that [as a child]. The only hard thing about being a single parent is that you don’t have that other person to look over to at three o’clock in the morning, and you both know you’re going to remember this 20 years from now. 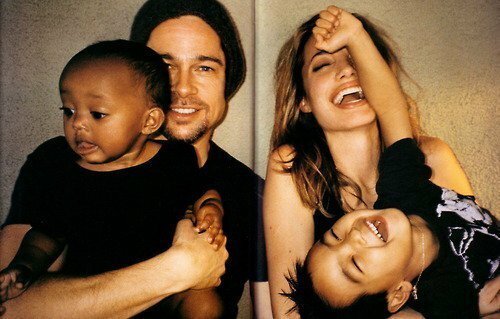 I think that’s the saddest thing: that you don’t have somebody to be jumping up and down with together sharing in the excitement of his first few words.” Just two years later, Brad Pitt legally became Maddox’ father. Given Angelina’s resources I would have done the exact same thing; learned to fly and adopted an orphan child to share this world with. At 24, I was convinced I would spend my life alone. I couldn’t imagine finding someone who could be every thing I needed. And I was fine. I was genuinely, positively fine with it. I had the world and that was enough. So that winter I met the love of my life. Of course. Because I honestly believe that in order to find your soul mate, you have to be totally, utterly fine on your own. In a very real way, she never stops chasing freedom. As she gets older, she just redefines what it means. Freedom for teenagers means freedom of movement and exploration. Capably flying a plane by yourself to unfamiliar locations is literal freedom. Being in love, being in a healthy relationship and loving your children over everything is freedom of another kind. And finally, feeling like you are of use to others, that your life matters, is maybe the biggest gift of all. I’ve never been the sort of person desperate to have children, and I’ve never been very good at getting involved or paying it forward. I’ve always kind of been stuck in my little bubble, and all I’ve ever cared about was telling stories that left some sort of imprint in the world. But if I do break out in the world, and if I do have children some day, I know exactly whose light to follow. As she matures as a humanitarian she talks a lot about how much meaning it has given her life. In her younger years she was self-destructive, always searching for a way out that window tattooed on her arm, but now she can channel that energy into helping others, and she never feels self-pity anymore. She finally had the window removed. Now she has more than 30 tattoos, most of them loving mementos to her family. In less than 8 years, she and Brad had 6 children. They all seem very happy. In 2014 alone she has traveled to multiple refugee camps, had a hit movie with Maleficent, made an honorary Dame by the Queen of England, wrote and directed a small indie movie with Brad called By The Sea, hosted a Global Summit in London on sexual violence in war zones attended by activists, changemakers, diplomats and politicians from all over the world, got married, and released her second film Unbroken, the biopic of her real-life hero Louis Zamperini, about the greatness of the human spirit. But it’s almost impossible to take in the scope of her life. It’s not attainable for someone who isn’t famous or have a lot of money and connections. So in a sense, unless you read between the lines, it’s hard to perceive her as anything other than this larger than life character. Her life may seem charmed (or horrific, depending on your view of fame) but her words and the action behind them are genuine. Each time there is a new humanitarian crisis anywhere in the world, she quietly donates $50,000 or more. Her philosophy on her income has long been ‘save 1/3, live on 1/3 and donate 1/3’. Although she now holds an official position with the UNHCR as Special Envoy to the Secretary General, she has never collected a salary and pays for her own trips and security. Some pictures and quotes assembled by instagram user @angelinafans. Definitely follow her if you want to learn more about Angelina. Wonderful post. I love her. Eerie! I was just looking up a picture of Angelina in heels for something I am writing and then I click on my blog to see you liked a post of mine. I click to read about you and voila! There she is, Angelina. I am always amazed at her commitment to helping those in need around the world. Certainly, she was presented with many opportunities from a young age. However, it was her desire to learn about and become involved in cultures/lives that transformed her impact into something that the majority of Hollywood starlets and those with privilege could never dream of. Thank you for writing this piece and reminding me that our weaknesses can often present as empathetic strengths to those around us. I resonate with this SO much! Perfect timing, wow. She is truly an inspiration. Lovely post! I find being in love with the world the best way to live life and having a heroine to follow their footsteps is wonderful. 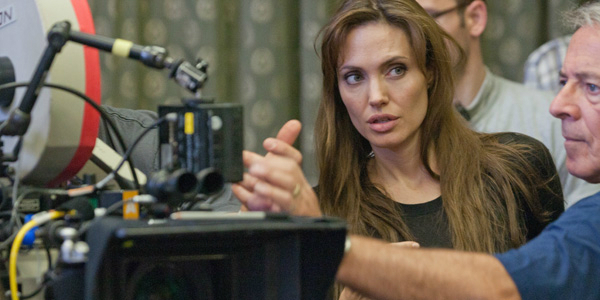 This is a perfect, beautiful post written about my heroine and inspiration, Angelina Jolie. I’m thrilled that Joey-an amazing woman and incredible writer, found her way to my little corner of the world so that I could find hers. I look forward to more of Joey’s excellent posts! Thank you for stopping by and liking my post about Lana Del Rey! I agree it is a well crafted piece about an incredible woman. It has taken me nearly fifty years to figure out how to help others in a way I enjoy so she is lucky in that she discovered her talents in giving and helping at such a young age. Beautifully written piece. She certainly has done a lot for the world. I can see why you admire her. This is making me think…There may be a lot to fix around us but…we can all do so much and we have a lot to offer!! Absolutely! I think Angelina is using her celebrity in the best way she can – to front the causes that are so important to the world right now, but she would probably still do it if she wasn’t famous. I think living your life in such a way that it can serve as a good example to others is the biggest gift a person can give to the world, whether that is on a large or small scale. What an inspiring post – about TWO inspiring women! Love your post! I’ve watched a lot of her movies as well as her father’s. Now I know more about her as a person. I did not know that! That is such a beautiful concept. I definitely tend to project a lot onto other people and sort of forget about myself – I guess it comes with being a writer. Thank you for reading and leaving such a meaningful comment. Everything about this post is gorgeous. <3 Angelina Jolie was also my role model for the same reasons! Inspiration can be found anywhere and from so many different kinds of people. This is a hellavua piece… I loved the juxtaposition of your own life with the inspiration you’ve found from Angelina’s. And thank you too, because I’ve always shied away from reading too much about celebrities. I’m glad to have learned so much about her. Thank you so much for reading, and your kind words. I know posts about mega-celebrities are usually a waste of time, so I’m grateful you took a chance on this one. I will forever find it weird that she has been assigned such a tabloid persona because to me, she’s really one of the most genuine people in the public eye. Appreciate the honesty of your views… the amount of material and introspection you must have gone through to come up with that… Thank you for sharing this! This is an awesome piece! Nicely done. You’re welcome. Keep up the awesome blogging!